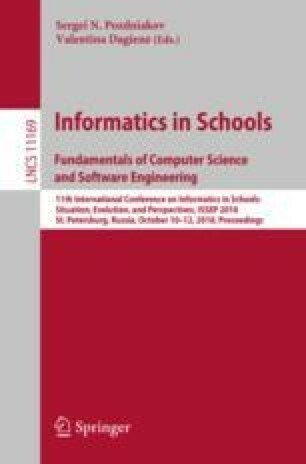 This paper describes a study into how secondary school students construct knowledge of programming. The study consists of three classroom sessions. In the first session the students play a simple video game called LumberJack. Then, they are asked to describe the rules of they themselves playing the game as an algorithm in natural language. In the second session, the students are asked to design an automata for a program that plays the game. In the third and final session, the students write programs that play the game and execute them in the programming language called TurtleBots. The aim of the study is to help learners establish a correspondence between the algorithm and the elements relevant to the execution of the program. The results obtained in this study offers significant insights which contribute to the development of didactic guidelines for the introduction of programming to novice learners. These results are presented and analysed in Sect. 4. We would like to thank teacher Néstor Larroca and students of second year of Liceo 2, La Paz, Uruguay, where we developed the study; Bruno Michetti for supporting the activities; and Manuela Cabezas for correcting the English. The comments of the anonymous referees are gratefully acknowledged.